I’m still trying to get my head around this recent Slate magazine article on Seeking: How the brain hard-wires us to love Google, Twitter, and texting. And why that’s dangerous. In this blog post, I’m basically trying to tie this article on “Seeking” together with two related topics: “Information Foraging” and “Twitter”. The article goes on making several intertwined arguments which I’m trying to sort out here. One of the arguments focuses on reporting how lab rats can be artificially put in “a constant state of sniffing and foraging”. It has been observed in experiments that rats tend to endlessly push a button if the button would stimulate electrodes that are connected to the rat’s lateral hypothalamus. This gets rats locked into a state of endless repetitive behavior. Scientists have since concluded that the lateral hypothalamus represents the brain’s pleasure center. Another point is made based on work by University of Michigan professor of psychology Kent Berridge (make sure to check out his website after reading this post) who argues that the mammalian brain has separate systems for wanting and liking. Think of it as the difference between wanting to buy a car, and liking to drive it. Wanting [or seeking] and liking are complementary. The former catalyzes us to action; the latter brings us to a satisfied pause. Seeking needs to be turned off, if even for a little while, so that the system does not run in an endless loop. Interestingly, our brain seems to have evolved into “being more stingy with mechanisms for pleasure than desire”: Mammals are rewarded by wanting (as opposed to liking), because creatures that lack motivation (but thrive on pleasure) are likely to lead short lives (due to negative selection). This brings me to a book I’m currently reading on “Information Foraging Theory” by Peter Pirolli (I have not finished it yet!). At the beginning, the book argues that the way users search for information can be likened to the way animals forage for food. Information Foraging Theory makes a basic distinction between two types of states a forager is in: between-patch and within-patch states. In between-patch states, foragers are concerned with finding new patches to feed on, whereas in within-patch states, creatures are concerned with consuming a patch. Information Foraging Theory is in part concerned with modeling “optimal” strategies for foragers that would maximize some gain (e.g. information value) function, based on the Marginal Value Theorem, depicted in the illustration below. 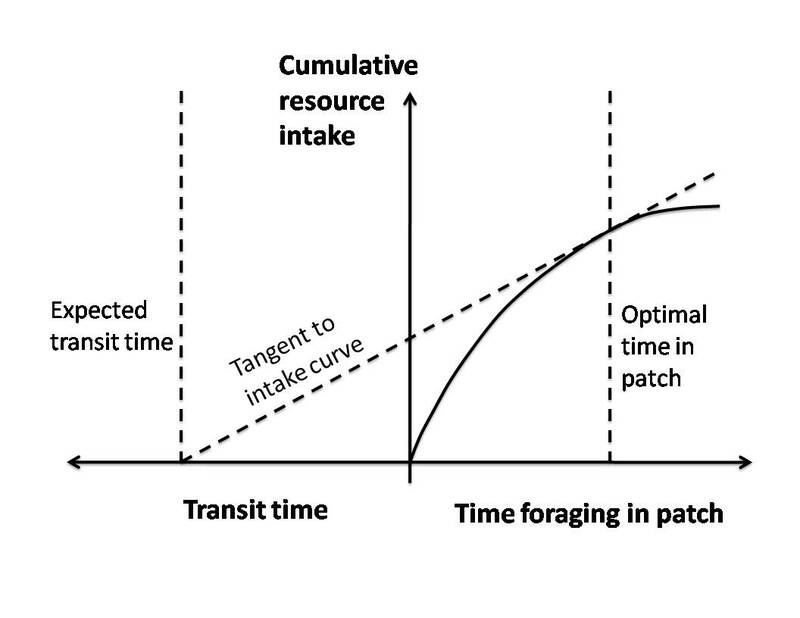 In this illustration from wikipedia, Transit time refers to between patch (left side) and Time foraging in patch refers to within patch (right side of the diagram). The slope of the tangent corresponds to the optimal rate of gain. There is an interesting relationship between time spent within and between patches. If patches yield very little average gain (e.g. calories, or information value), patches are easily exhausted, quickly putting foragers into the between patch state again. Now I’m trying to tie these two topics together (there might even be a common basis for the relationship between these topics in the literature). Seeking and Information Foraging: It seems that wanting and liking systems relate to within and between patch states in Information Foraging Theory. If lab rats push a button in an experiment, it seems that the rat’s electrodes modify their liking system in a way that prevents them from engaging within a patch, and puts them into a between patch state. When animals are sent into a frenzy by giving them tiny bits of food, within patch time is minimalized, sending them right back into a between patch state. In this scenario, animals spend relatively more time searching than actually consuming food, effectively reducing their overall gain in comparison to scenarios where they would be confronted with large bits of food (higher gain patches). Finally, how this all might relate to Twitter: I’m arguing that Twitter’s message restriction to 140 characters (disregarding links that might be posted in Twitter messages) artificially reduces within-patch time. The gains of a patch (a tweet) might still vary, but gain is not dependent on within-patch time anymore. The average “within-patch/gain function” (right side of the above illustration) seems to be constant! It always takes the same approximate amount to read a tweet (assuming there are no URLs in a tweet), reading “longer” does not increase the gain. In addition, Twitter’s particular user interface (chronological listing of tweets) seems to be weak in terms of information scent: Judging whether a tweet is relevant or not requires a forager to read the entire tweet, regardless whether the patch (the tweet) contains a gain (an informative value) or not. This seems to yield to a situation where in systems such as Twitter, users quickly change between within patch (reading a tweet) and between patch (finding the next tweet to read) states. The reason to that might be the following: When a forager has exhausted a patch, he would switch back to a between patch state. However, due to a deprivation of information scent on the Twitter user interface, the user is largely helpless in the between patch state (he does not know where to search next, other than reading the next tweet). This leaves users with a desire to change back to within patch states as quickly as possible (only reading entire tweets can help to assess relevance), thereby potentially adapting chaotic and/or irrational strategies. The above observation might also explain the frenzy that animals are sent into when being offered tiny bits of food while being deprived of “scent” to inform their between patch phases. The hypothesis would be that the frenzy would not occur if the animals were offered clues regarding where the next patch is to be expected, and what gain they could get from exhausting it (of course behavioural biologists might have already studied this question). Returning to Twitter, it seems that the same effect that sends animals into a frenzy could be at place at Twitter, where users – due to a combination of small within-patch times and weak information scent – engage in uninformed foraging of artificially small information patches. This of course is the provocative conclusion of the Slate Magazine article. What I found interesting is how these three topics – seeking, information foraging and Twitter – nicely tie into each other on a theoretical level. I still have not figured out what a reduction of within patch times alone means from an Information Foraging Theoretic perspective – I’d like to figure that out at some point in the future. Markus Strohmaier, Full Professor of Web-Science at the Faculty of Computer Science at University of Koblenz-Landau (Germany) and Scientific Director at GESIS - the Leibniz Institute for the Social Sciences (Germany). My research focuses on the World Wide Web, my interests include social computation, agents, online production systems and crowdsourcing. When is a student ready to finish his/her PhD? What is the size of the Library of Twitter? Workshop on "Networks Across Disciplines in Theory and Applications "
Categorization and reasoning among tree experts: Do all roads lead to Rome?